73 y.o male, s/p C5-6 corpectomy and anterior fusion of C4-6 with anterior plating for gradual bilateral upper extremity weakness and eventually bowel dysfunction. 5 days after the surgery, while in the hospital, the patient was struck by a food services cart. 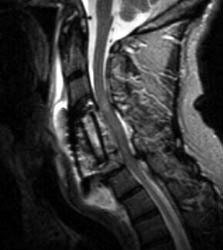 Noting after that incident, more pain and a new 'click' sound in the neck, further imaging was obtained. 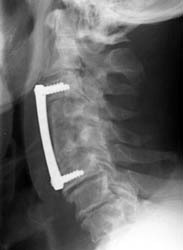 Immediate post-op radiograph demonstrate good position of the graft and fixation plate. This is lateral radiograph taken several hours AFTER the incident with the food truck. Note the distal end of the fixation plate has loosened and is nearly completely out. 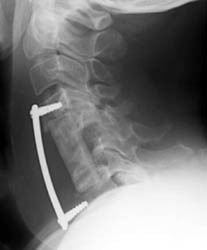 The distal screws have minimal purchase in the C7 vertebral body. 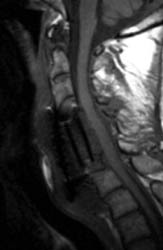 A B C Sagittal T2 FSE (A), sagittal T1 pre (B) and post contrast administration (C) show the graft with blooming artifact where the plate exists anteriorly as well as the screw (lower portion of the image). 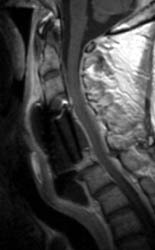 The susceptibility artifact of the screw shows its ventral positioning essentially outside of the C7 vertebral body. Also, there is T2 hyperintense fluid surrounding the surgical site with the graft material is now surrounded by nonenhancing mixed signal intensity material, predominately hypointense on T1 and hyperintense on T2, possibly suggesting some blood products. There is enhancement in both the anterior and posterior epidural spaces. The distal end of the fixation plate with the screw in the C6 vertebral body appears now displaced anteriorly and there is significant prevertebral soft tissue swelling. Also, this fluid- like material surrounding the bone graft appears to cause some narrowing of the spinal canal, with some mild spinal canal stenosis.